Saira’s search for kidnapped mixed-bloods draws her into the Mongers’ stronghold, revealing the horrible truth behind the irresistible Monger ring and the vile plan to cleanse Family bloodlines … permanently. 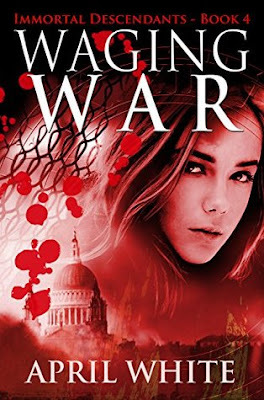 To prevent a brutal massacre, Saira and Ringo travel back to Bletchley Park during World War II where they team up with Archer from the past to crack a Nazi code and expose a Monger traitor intent on changing the course of history. They team with a female commando from the French resistance to hunt down an elite unit of Monger soldiers - Hitler’s Werewolves - before the terror squad can strike a fatal blow at the heart of the Allied war effort. Their desperate manhunt drags Saira, Archer, and Ringo into the London underground on the eve of a Nazi bombing raid where they come face-to-face with the Monger assassin on a suicide mission to split Time. With the lives of all mixed-bloods in peril, Saira must make a sacrifice that even Time and love may never forgive. Waging War was another great read. I love how the author uses history and makes it so much fun to read. I like WWII history anyways, but I did learn some things I hadn't previously known. Note this is the fourth book in the series and not in any way a standalone book. You should have read the first three before reading this one. Man Archer, Saira, and Ringo sure know how to get themselves into some binds! This story was particularly interesting because a lot of time travel things come up that they have to deal with. Like when they go to a time Archer already is so present Archer can't go with them. And what about Saira's interactions with past Archer when present Archer is waiting for her to return. Is that fair to either of them? It brought up a lot of interesting things to think about and how difficult it would be to be Saira. Now this book is set during World War II, mostly in France where they are trying to track down some people who may end up splitting time and try to stop them. It was a really heartbreaking chapter as WWII was not a fun time to be. Not that the other eras were, but man so many people were killed during the time it would be hard to be there and not really be able to do much to help. Trying to keep yourself alive is a task much less everyone else. My heart definitely hurt for them as some of the things they witness were terrible. While Saira and Ringo are in the past trying to keep time moving in the right way, Archer and gang are trying to find the mixed-bloods and see what they can do about the Mongers kidnapping them. Some of the seer kids have some not so good visions, Archer tries to keep everyone safe and okay, but sometimes plans don't go exactly as you expected. In either time. It would be so odd to be Archer and have your memories start to come back from the past that you now know because Saira was back there with past you. It's interesting to think about and how that would actually be if you were him. Learning things that happened that you had forgotten, or not known until now, and dealing with the dangers in the present would be a bit tricky. I can't wait to read the last book and see where everything goes from here. Saira, Ringo, Archer and the whole crew have their work cut out for them. I know it will be awesome in the end, but getting there might be tricky.